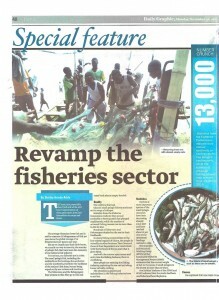 The Daily Graphic, considered the widest-selling newspaper in Ghana, ran a center spread special feature Nov. 30 on the crisis in the fisheries sector in Ghana. The story and photos, titled “Revamp the Fisheries Sector,” discussed CRC’s role in addressing the problem through the work of the USAID-funded Sustainable Fisheries Management Project (SFMP). The article discussed key activities of SFMP and mentioned Brian Crawford, CRC’s in-country chief of party for the project.